Korean Air is aggressively expanding its European cargo network by launching services to Vienna, Austria and Oslo, Norway, the nation's largest airliner announced recently. On Mar. 29, 2004, the Incheon-New York (JFK) return route was adjusted to add Oslo, Norway. The trans-Pacific cargo flights departing from Incheon make stopovers at Anchorage and New York before crossing the Atlantic, and reaching Oslo. A B747-400F is used on the modified weekly route. Shipments from Oslo are comprised mostly of Norwegian salmons and shipbuilding machinery. On Mar. 31, 2004, the national flag carrier started another weekly flight to Dubai in addition to its weekly charter flight already in operation. The flight makes a stopover at Mumbai before reaching Dubai and returns to Incheon via Bangkok. 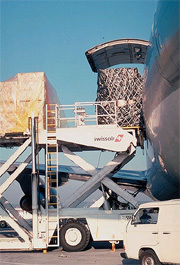 On April 18, 2004, Korean Air began cargo service to Vienna in Austria in Eastern Europe. One weekly flight, using B747-400F, operates every Sunday. The direct Incheon-Vienna flight returns via Brussels. As the world economy is picking up, international cargo market is growing as well. In the face of strong competition from other carriers Korean Air Cargo has managed to boost its traffic by over 25 percent on Europe routes during the first two months of this year. The two latest European destinations of Korean Air will help facilitate faster and more efficient transport of goods by establishing direct routes. Aside from the positive results in Europe routes, Korean Air also benefited from the growth of emerging markets in China and India to which increasing number of Korean companies are now exporting more goods including cell phones, semi-conductors, and LCD panels. Korean Air's cargos expansion is a part of its plan to maintain a dominant position in the international cargo market, according to the spokesman Crimson Lee, manager of Korean Air's Corporate Communications Team. 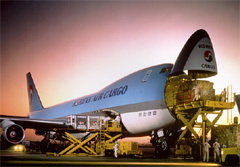 Lee said Korean Air has consistently ranked among the world's top three commercial cargo carriers. It aspires to become the world's largest cargo airline company by the year 2007. For that Korean Air will introduce larger-capacity freighter jets including the state-of-the-art B747-400ERFs. Additionally, Korean Air plans to cooperate more closely with its SkyTeam Cargo counterparts in its effort to maximize the synergies the cargo alliance creates. One of the world's 20 largest airlines with a combined fleet of 116 aircraft, Korean Air operates nearly 400 daily flights to 87 cities in 31 countries. Korean Air is a founding member of SkyTeam, the global airlines alliance in partnership with AeroMexico, Air France, Alitalia, CSA Czech Airlines, and Delta Air Lines.